I couldn’t stop crying. I was surrounded by friends in my room at the Praunee Guesthouse in Bangkok and I couldn’t stop crying. It was that kind of weekend that began around midnight on Saturday and kept going until I had to depart for reconnect training in Supan Buri Monday morning. There’s a bad pop song from the 80s that says, “One night in Bangkok makes a hard man humble.” I wouldn’t say it made me humble, but it is difficult to pace yourself in that town. Joining Josh, Tracy and Jade outside their hostel, we were told the party was at a dive bar called Wang’s. We had no idea where it was and neither did our taxi driver. Once we did find it we realized why it was so hard to find – it’s in the middle of nowhere and it doesn’t look like it was even open from the street. The door and windows must have had good insulation because the music, shouting and laughter could hardly be heard from the street, but once the door opened, Wang’s sounded like every bar on State Street in Madison on a Saturday night. What made it even better is it was filled with my friends I hadn’t seen in three months. Hugs and handshakes were exchanged for my first 10 minutes and I soon realized I was out-of-place not having any alcohol in my system. Quickly, a Leo was placed in my hands. From left: Josh, Tracy, some dude and Mai. This was that night I slept with a man. Paul’s friend from the states, Scott, was hanging with Paul for a few weeks and Paul was kind enough to let me stay in his room that night since I had no official place to stay. The only condition was I had to either sleep on the floor, which was a dirty tile, or share the twin-size bed with Scott. I laid down around 3 a.m. It was at 4 a.m. when I proved that I will talk baseball with anyone at anytime. I had just fallen asleep and Scott returned and laid down next to me. First he asked about Brett Favre and I said, “If you want to talk sports, I’ll talk Joe Mauer, but I’m not talking football.” Thirty minutes later our conversation finally ended and we fell asleep. From left: Scott (my sleeping partner), Paul and Siriporn chill in our room. I believe Paul is singing a song about chewing tobacco. Saturday was a very important day for me as a Peace Corps volunteer in Thailand because Saturday I found a book store, and not just any bookstore. I found the Thailand equivalent to a Barnes & Noble. After meeting my new friend Mai at the BTS (Bangkok train) stop, we went to Kinokuniya Books at the Paradigm mall. I made a beeline for the Philip Roth novels and picked out the largest one I could find (Operation Shylock), called Dev for confirmation on its awesomeness, and bought it for 400 baht, or 13 plates of fried rice with pork at my site. Then Josh, Tracy and I did something un-American. Well, un-American to some people. 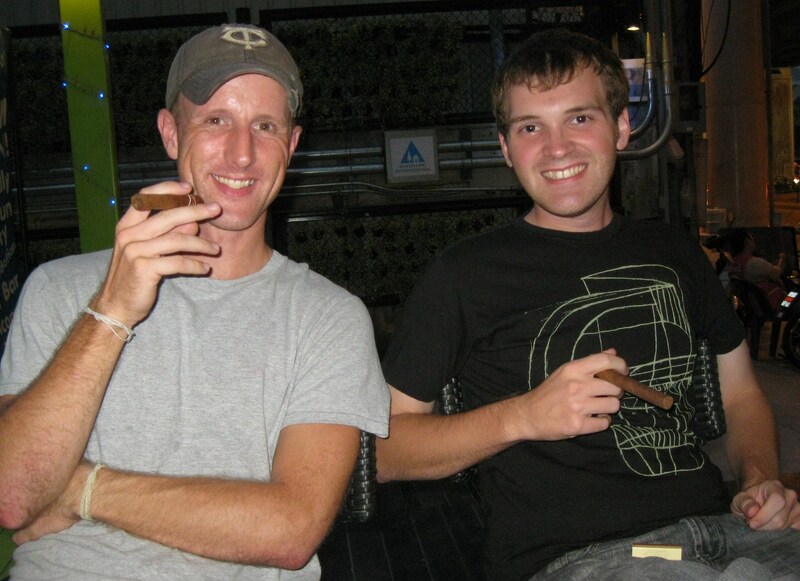 We contributed to the Cuban economy by purchasing cigars. I hadn’t had a Cuban cigar since I went to Canada when I was 20. They were also a bit pricey (400 baht), but worth it. Josh and I enjoying the communist in us. Sunday consisted of my first Indian meal (delicious), a return trip to the bookstore with Josh (couldn’t hold back from buying another Roth novel as well as a Michael Chabon paperback) and my crying fit. I’d only heard of the comedian Louis C.K. About 45 minutes into his routine, my laughter reached the point of tears. Paul and I were sitting next to each other on a floor and I was having trouble keeping my balance as Louis C.K. described what he found in his two-year-old daughter’s diaper. I soon became more entertaining than the comedian as I had little control of my emotions. 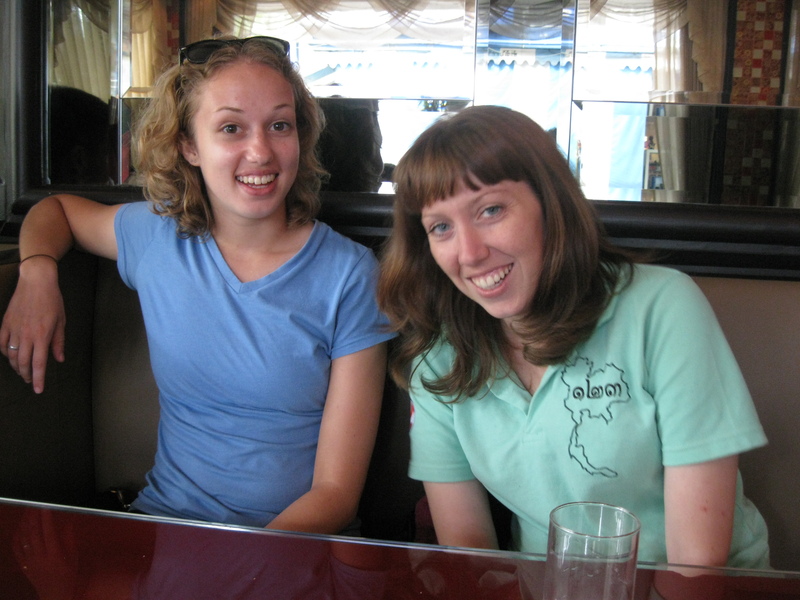 Megan, left, and Tracy share a laugh at the Indian restaurant. Although we were in one of the craziest cities in the world with much to do around us, it felt great to sit in a small hotel room with friends and watch TV. 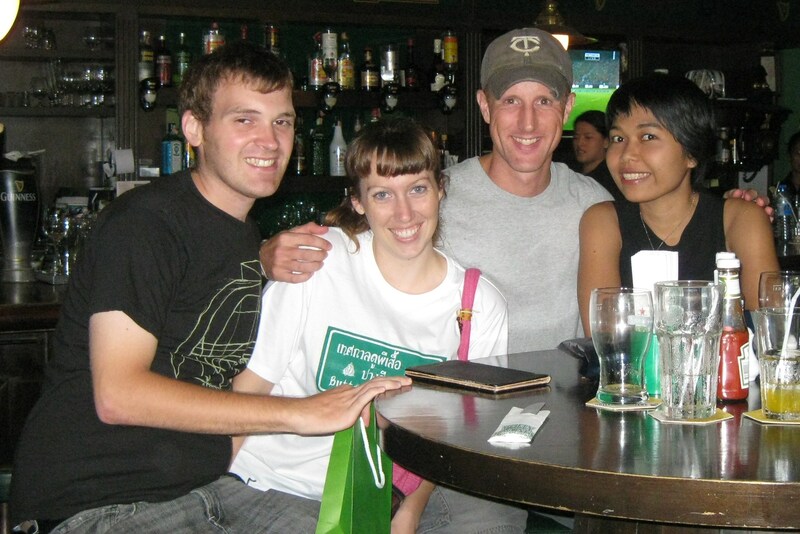 Josh, Tracy, Megan and I made our way to an Irish pub that evening at it was after I paid 500 baht for three pints of Heineken that I fully realized I wanted to get out of Bangkok. The next morning I headed to Supan Buri for reconnect training with Roger, Daniel and Paul. I was about to spend the next 12 days with my newest 62 friends. The fun had just begun. This entry was posted in Peace Corps and tagged bangkok, louis ck, michael chabon, peace corps, philip roth by Jeff Jackson. Bookmark the permalink. I like the before and after trick with the crying…I couldn’t control myself either watching Louis C.K. Josh can vouch for that.